Western blot analysis of extracts from various cell lines using TAZ (E8E9G) Rabbit mAb (upper) and β-Actin (D6A8) Rabbit mAb #8457 (lower). Expression levels of TAZ among cell lines are consistent with expectations based on publicly available bioinformatic databases. Immunoprecipitation of TAZ protein from HeLa cell extracts. Lane 1 is 10% input, lane 2 is Rabbit (DA1E) mAb IgG XP® Isotype Control #3900, and lane 3 is TAZ (E8E9G) Rabbit mAb. 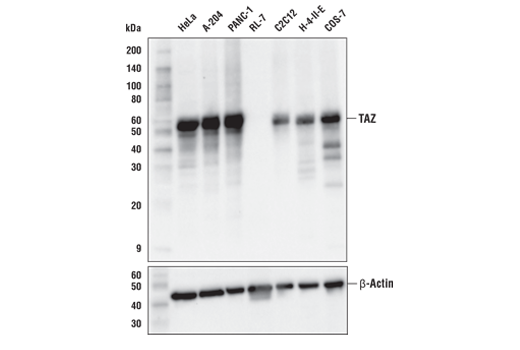 Western blot analysis was performed using TAZ (D3I6D) Rabbit mAb #70148. Mouse anti-rabbit IgG (Conformation Specific) (L27A9) mAb (HRP Conjugate) #5127 was used for detection to avoid cross-reactivity with IgG. 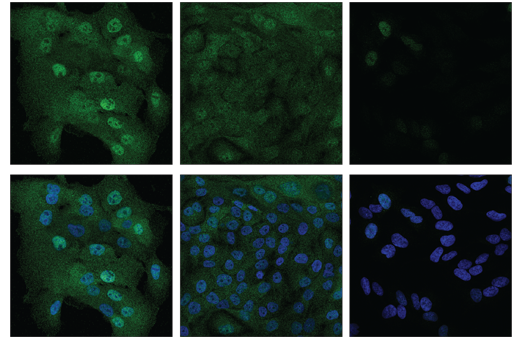 Confocal immunofluorescent analysis of MCF 10A cells (high-expressing) at low (left) and high-confluence (middle) versus SH-SY5Y cells (right, low-expressing) using TAZ (E8E9G) Rabbit mAb (green). Nuclei are labeled with DAPI #4083 (blue). Note that decreased nuclear localization of TAZ protein is seen in high-confluence MCF 10A cells. 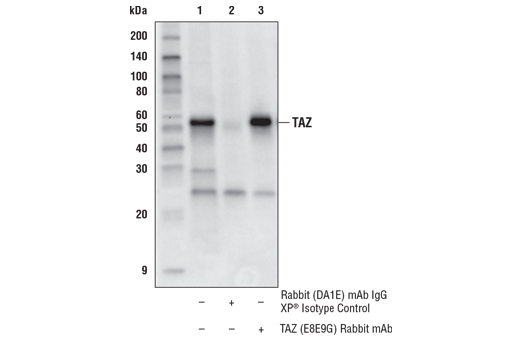 TAZ (E8E9G) Rabbit mAb recognizes endogenous levels of total TAZ protein. This antibody does not cross-react with YAP. Monoclonal antibody is produced by immunizing animals with recombinant protein corresponding to human TAZ protein. The epitope has been mapped to a region surrounding Pro49.